Thanos himself has become the latest in a long line of celebs to head down to Springfield, and it appears he is still up to his old antics. Opening up the latest episode in the long running cartoon series, a brief clip shows Thanos making himself home at the Simpson family home, using their iconic orange sofa as his makeshift throne. Apparently nonplussed about the grief and devastation he caused in Avengers: Infinity War, Thanos can be seen assembling the Infinity Stones, using baby Maggie’s pacifier – which she actually hands to him! – to complete the Infinity Gauntlet. Giving viewers a stomach churning sense of déjà vu, Thanos obliterates the majority (more than 50 per cent…) of the Simpson family – Homer, Marge, Lisa and Bart – before kicking back on the sofa looking quite pleased with himself. Fans of The Simpsons have weighed in on Maggie’s apparent compliance with the Marvel super villain, speculating that the apparently ice cold infant could be in cahoots with him… and is now his new daughter. Many people have pointed towards Maggie’s surprising past – which includes shooting Mr Burns and hitting Homer on the head with a mallet – as markers of a potentially much darker character altogether. One fan mused, ‘theory: Maggie Simpson is Proxima Midnight’, while another noted, ‘Thanos has a new daughter in Maggie’. 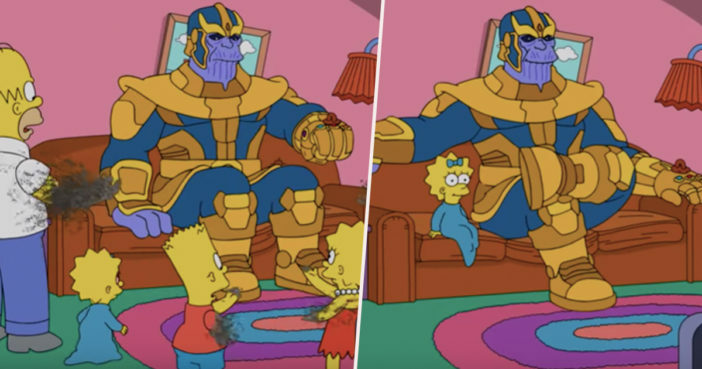 Although many have praised the ‘amazing crossover’ between the two unlikely universes, some fans were a little peeved by the ‘inaccurate’ intro, noting how Thanos didn’t even bother to click his fingers to wipe out the Simpson family. It pains me that he didn’t snap. But… he didn’t snap his fingers. The Simpsons have really picked the wrong fanbase to hack off with this blatant inaccuracy. But maybe Maggie’s dummy is powerful enough that no finger clicking is needed? The laws of physics in the Springfield Cinematic Universe are probably a bit different after all. As reported by ComicBook, directors Joe and Anthony Russo have revealed we will see a different side to Thanos in Avengers: Endgame now he has achieved his aim of wiping out half the universe. These are characters and a story moving forward where Infinity War happened, The entire universe experienced the same fate, and has been brought together by this experience. 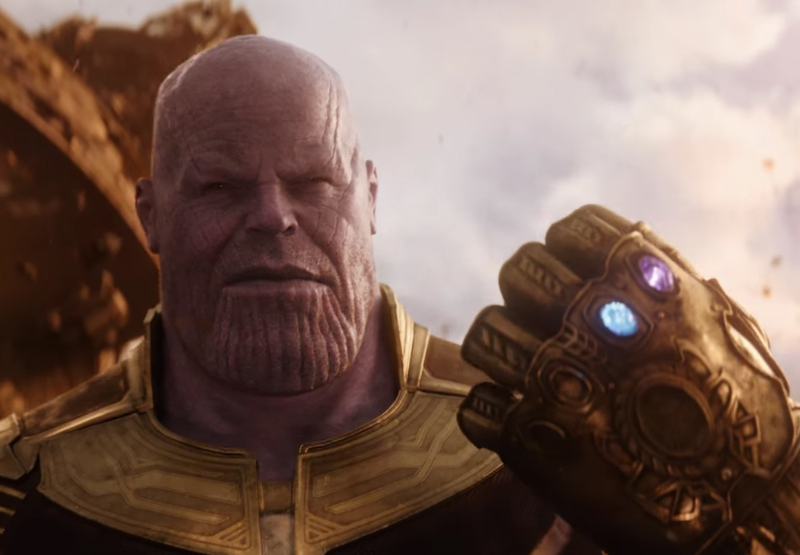 I must say though, Thanos is reportedly going to have an even more prominent role in the upcoming sequel, and it’s therefore highly unlikely the purple giant will be content with rounds of afternoon golf and early bird suppers just yet. Were you excited by this surprise merging of worlds? You can catch Avengers: Endgame in UK cinemas from April 26, 2019.